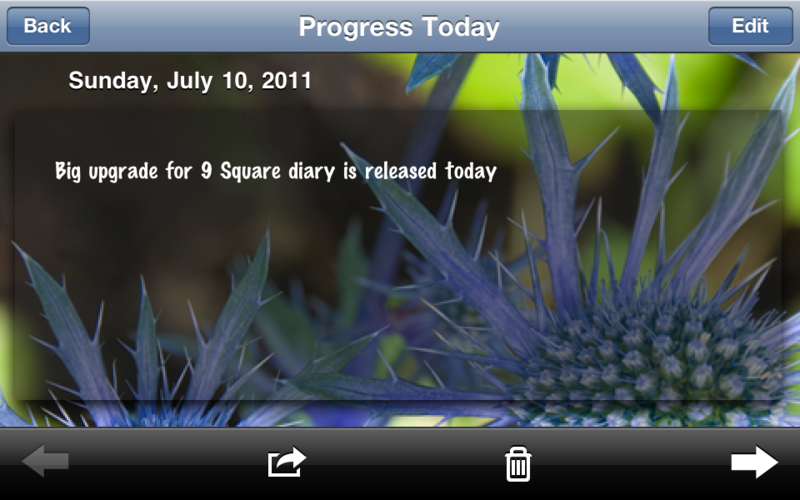 9 Square Diary is a finished-in-a-minute diary format for iPhone. If you don't have so much time for your diary, but you really want to remember your best or worst, moments in life, 9 Square Diary is the exact what's your choice. 9 simple grids remember your 9 different life areas. Simple and classified is our shining point. - Optimize the toolbar icons. • Easy-to-use: Like JCloze, it is very simple to fill in. • Integrate with Facebook, Twitter, Sina Weibo. • Take photo and photo embedding is supported. • Voice/audio recording and playback. • Allow to change your diary background and colored text with many of font type and size. • Weather indicator and location for each diary. • Provide passcode lock for your diary. • Great diary review experience. • Email your diary is supported. How to switch pages or review previous diary? 1. 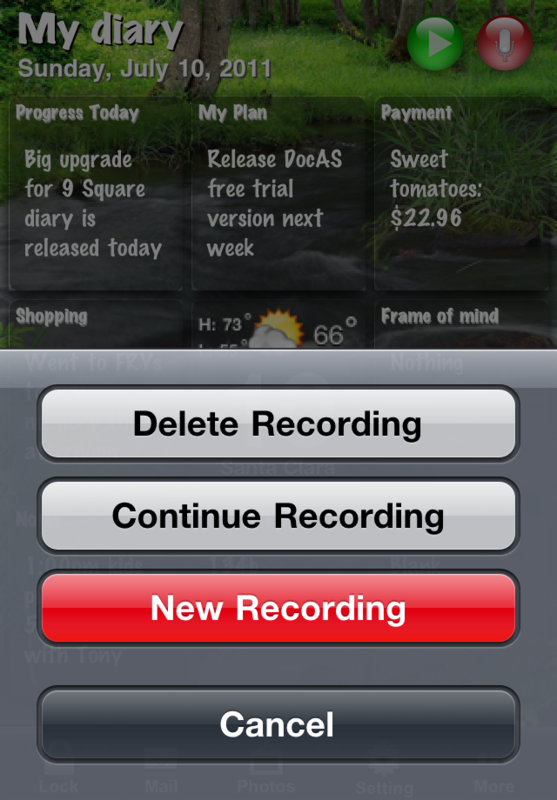 Swipe your finger from left to right at center panel (Weather/date area) to review previous diary page. 2. 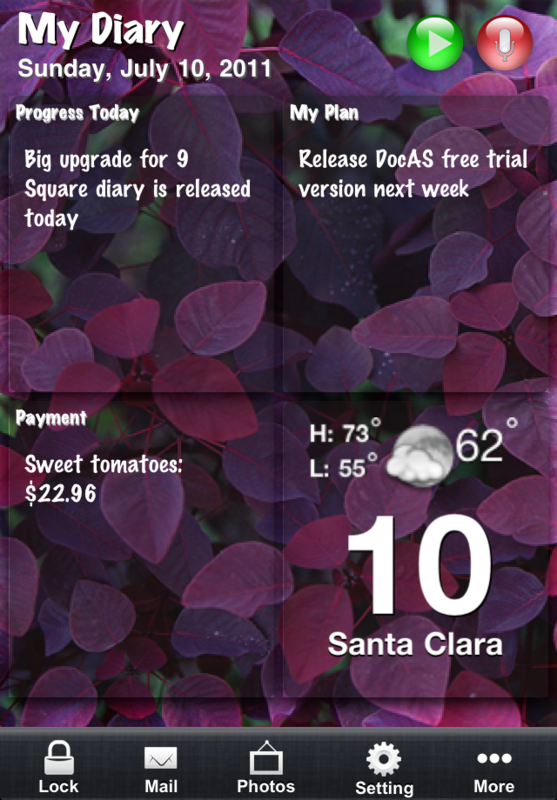 Swipe your finger from right to left at center panel (Weather/date area) to review next diary page. 3. Click the date item on toolbar to get calendar date for you selecting a specified date diary.